"NOW meet the most extraordinary gentleman spy in all fiction!" Dr. No was the first James Bond film. Starring Sean Connery, the film established many of the Bond film trademarks, such as Bond being viewed through a gun barrel at the opening of the film, and a highly-tech opening title sequence that would remain a hallmark of Bond films to the present. The exotic locale for this film is Jamaica, where Bond arrives to investigate the death of a fellow agent. He is immediately followed and becomes aware that enemy spies are everywhere, including in his own limousine. He suspects his driver of being a spy, and upon questioning, the driver kills himself with a cyanide cigarette. Bond comes across a CIA agent who explains that someone in Jamaica is using radio frequencies aimed at American Rockets. The CIA agent mentions Dr. No, a recluse who lives on a nearby island called Crab Key. The island is heavily guarded. When one of Dr. No’s henchmen alerts him to Bond’s presence, the doctor sends an assassin to kill Bond with a poisonous tarantula. Only Bond’s keen senses and quick action prevent him from being killed in his sleep. Bond makes his way to Crab Key, where he meets Honey Ryder, played by Ursula Andress, who is wearing only a white bikini. Eventually, Ryder and Bond are attacked by the “Dragon of Crab Key,” which turns out to be a flame-shooting tractor. Bond and Ryder are captured, decontaminated, and taken to rooms where they are drugged. Soon they find themselves dining with Dr. No, who reveals that he is part of SPECTRE (SPecial Executive for Counter-intelligence, Terrorism, Revenge, and Extortion), and plans to disrupt a Mercury rocket launch from Cape Canaveral with a radio beam. Bond finds himself in a holding cell, which he escapes through a vent. He finds Dr. No in the control room and attempts to disable the radio beam as the American rocket launches and he fights with Dr. No. 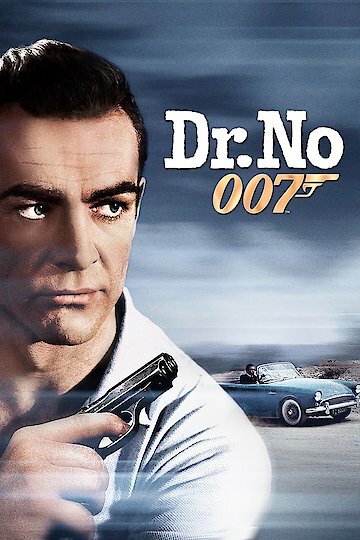 Dr. No is currently available to watch and stream, download, buy on demand at Netflix, Vudu, Google Play, FandangoNow, iTunes, YouTube VOD online.